We really love cooking, eating and experimenting on that field, especially with food that is local and that we don’t know so far. Definitely, cooking and cooking utensils are of high importance for us! For cooking we have a Coleman Petrol Stove. The downsides are that it is large and quite heavy, but apart from that it is a most valuable piece of gear: petrol is available nearly everywhere and also provides enough power (i.e. heat when burned) even in cold or humid climates. The stove can be combined with the Coleman Camping Oven which can be put directly over the stove’s flame and be used for baking even specials like cup-cakes. Our Dutch fellow nomads Coen and Karin-Marijke have published a great review on their valued Coleman stove. So far, we didn’t use our Dutch Oven that much, but the roast venison the other day simply was gorgeous! The Dutch Oven can be used (for baking bread, for soups, roasts and even pizzas) on hot coals, on the stove or directly in the fire. It is very heavy but sometimes quite useful to enlarge the range of possible outdoor-meals. We also have a barbecue-grill, which can be folded together and put into a bag. Just enough for four people with plenty of time for eating. Apart from canned food or food that comes in glasses or bags, we store all our food and spices in Nalgene bottles of different sizes or in Lock & Lock boxes, which really are great, especially in the fridge. It is easy to find a good camp table with a reasonable pack size, but camp chairs are a totally different story. After we put a lot of research (and time) into finding a chair that is comfortable, durable and which you can repair almost anywhere, the only really good one we found so far is the "Kermit Chair". Now, compared to the first camp chairs we had, we can carry four in the same space before was needed for one! And they are quite comfy, too! See our post on "The Perfect Camp Chair"! 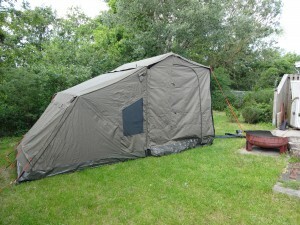 Then, there is the Oz-Tent RV4. The Oz-Tent can be set up in just about 30 seconds (OK, it needs a few minutes more for fixing all the ropes to make it really wind- and rainproof), is made for hot climates and can easily be stored on the roof rack. 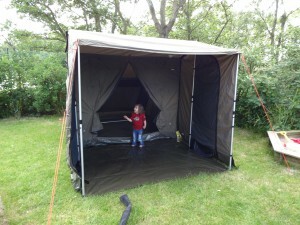 In rainy or hot weather, it helps a lot, especially with young children: set up the Oz-Tent, put in toys, some food etc. ... put in the children ... and relax and set up the rest of the camp taking your time (provided that the children don’t start quarrelling!). 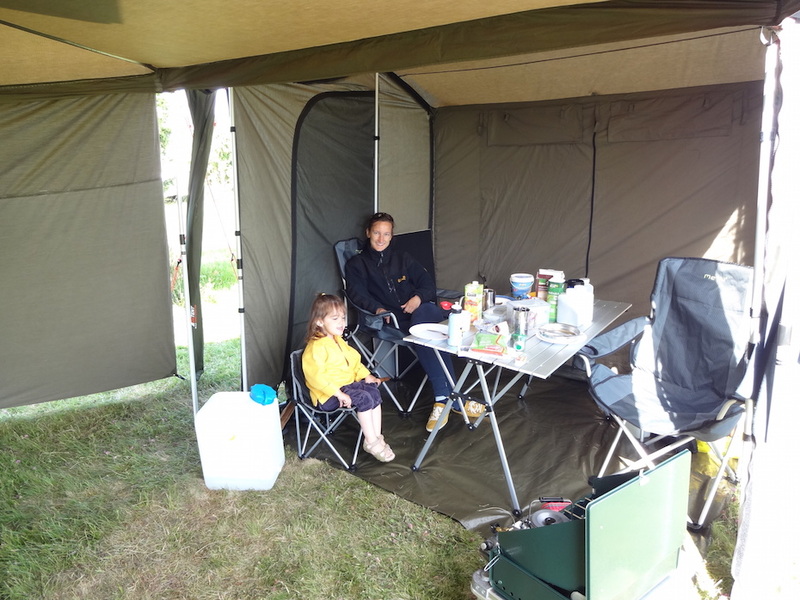 The Oz-Tent also is great if the car has to stay in a workshop for some days – you still have a comfortable place to sleep in! In combination with the Oz-Tent Awning Connector, the Oz-Tent can be zipped to a Foxwing or any other Oz-Tent, to create an even bigger “living room“ (you can also use the Awning Connector to connect two Foxwing Awnings). Simply Great! Go and buy one!